MAGIC STUDY's 10th Anniversary Give Away!! Can you believe it's been 10 years since MAGIC STUDY was first published? I can't. Then again I can't believe it's October 24th of this year already - where did September and early October go? 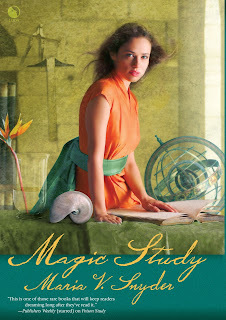 Magic Study was first published as a hardcover in October 2006. It was published a year after Poison Study hit the shelves and it was well received - it sold more copies than Poison and that's a good sign in the publishing world :). During the last 10 years, Magic Study has gone through a number of cover designs. The original hardcover matched the original hardcover of Poison Study - they were based loosely on two different Johannes Vermeer paintings - Poison on Girl with the Pearl Earring - and Magic on The Geographer. Unfortunately, the model who had posed for Poison's cover had returned to her native Russia and another model was used for the second book. Can you see the difference?